The Snappy range which includes Snappy 300, Snappy 400 and the NEW Snappy Ladder are lightweight, heavy duty work platforms which fold out and assemble in seconds. Highly versatile, they can be combined with Instant Span Tower Systems to gain working heights up to 4m. The simplicity of the design reduces the risk of incorrect assembly or the loss of components. Snappy features the unique high strength Rib-Grip jointing system, guaranteed for 10 years. Used by many different trade types such as decorators, electricians, heating and ventilating contractors and sign-writers, Snappy provides a robust work platform which can be transported in a small van. 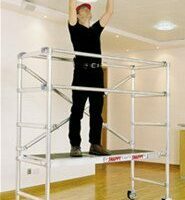 The Snappy range which includes Snappy, 300, Snappy 400 and Snappy Ladder are lightweight, heavy duty work platforms which fold out and assemble in seconds. 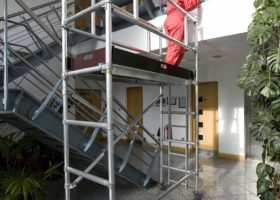 Highly versatile, these low level access tower systems can be combined with Span Tower components to gain working heights up to 4m.